After losing his son, Demetrius Branca is championing the fight to end distracted driving in Florida, encouraging teens to make positive choices while driving and to speak up if they are ever in a car with a distracted driver. 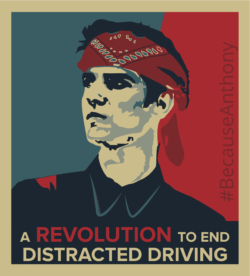 Tallahassee, FL – December 4, 2017 - After a distracted driver killed his 19-year-old son three years ago, Demetrius Branca vowed to assemble an army to wage war against distracted driving. Demetrius co-founded the Anthony Phoenix Branca Foundation, a non-profit organization named in memory of his son and dedicated to educating people about the dangers of distracted driving. Demetrius’ fight has taken him to high schools across Florida, sharing stories about Anthony, and reminding teens that they have an important choice to make each time they get into a vehicle. This week, Demetrius’ battle rages onward in his hometown of Tallahassee, Florida. For the third year in a row, students in Leon County will participate in the Week of Awareness, a week long, countywide event hosted by Florida Students Against Destructive Decisions (SADD), that brings a traffic safety speaker to high schools as a way to educate teens in Florida on the importance of making smart decisions while driving or as passengers. Car crashes are the number one cause of death for teens, yet these crashes are preventable. According to NHTSA, novice teen drivers are twice as likely as adult drivers to be involved in a fatal car crash. This is primarily due to lack of experience and the inability to stand up for themselves when feeling unsafe in a car. Passenger distraction and use of cell phones while driving are two of the most prevalent forms of distraction for teen drivers. Immediately following the presentation, students at participating high schools will take part in a traffic safety fair that involves local community partners such as: Leon County EMS, MADD, Department of Highway Safety and Motor Vehicles, and DISC Village.